Regular readers will know about my fondness for the Commands & Colors series of games by Richard Borg. This fantastic range of games is often referred to as ‘light’ wargame due to the simple, easy to learn rules and lack of tables or charts, but I think that does it a disservice. One of the strengths of this game is that it simulates the problems inherent in commanding armies in an elegant way. The command card deck limits the maneuverability of your forces and covers the plethora of problems that can cause orders to be lost or misinterpreted, etc, without complex rules. It also allows me to spend my time concentrating on my tactics rather than looking up rules, thus allowing me to stay engaged with both the game and my opponent. 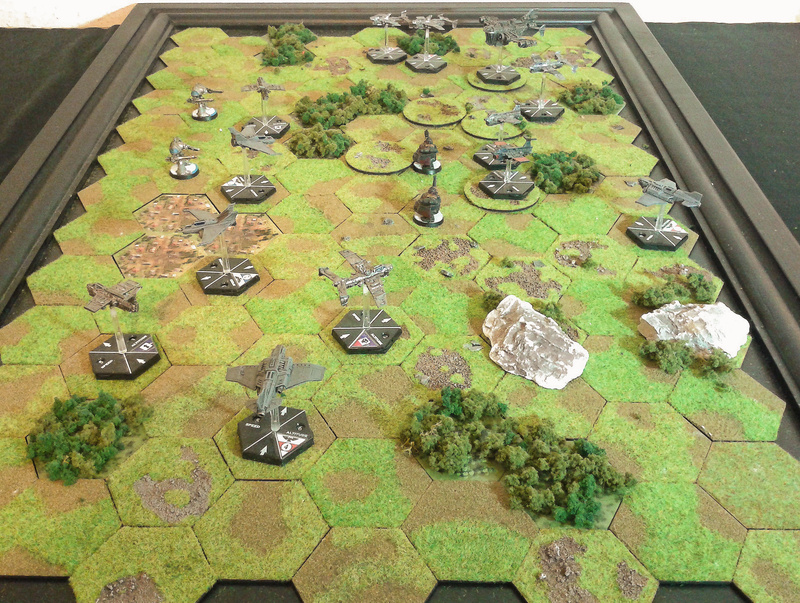 Several years ago I made a hex board on which to play Battlecry with my 10mm miniatures and the other day I setup the for board for a solo battle. 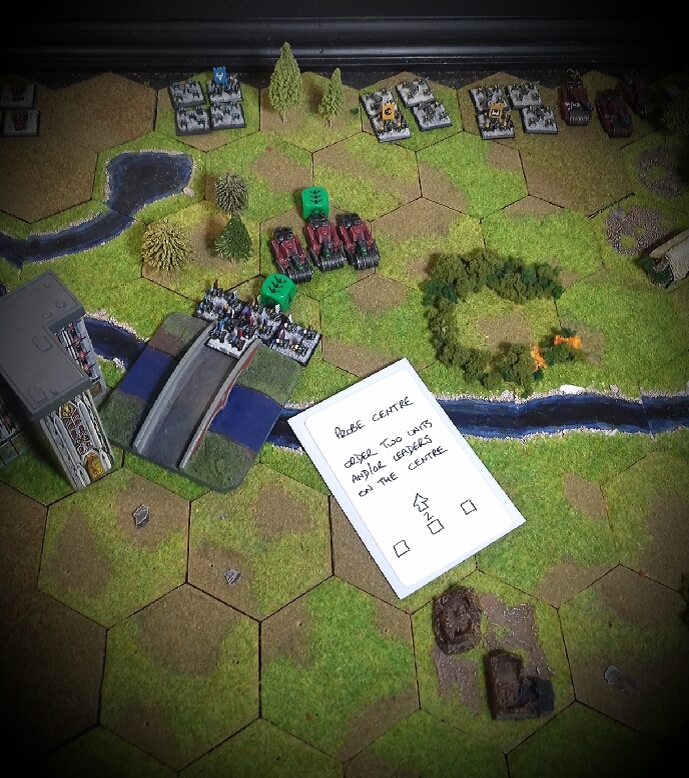 Rather than playing one of the many historical scenarios from the rulebook, I setup a ‘meeting engagement’ with random forces. Each army was lined-up in march columns at the side of the table and units could be brought on to the battlefield by playing a Section card and ordering units to march on from off table. The board setup with march columns top right and at the bottom right the solo playing aid. 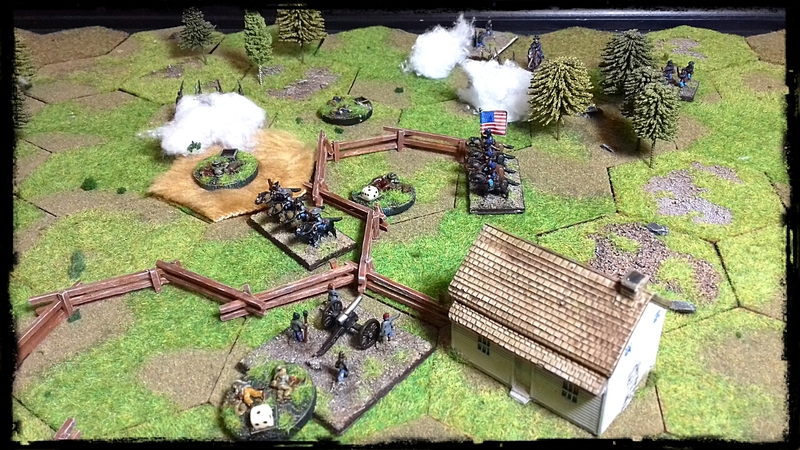 With a solid defensive position secured and fresh units coming forward, the Confederates are victorious. All in all this was a very entertaining game which swung back and forth. 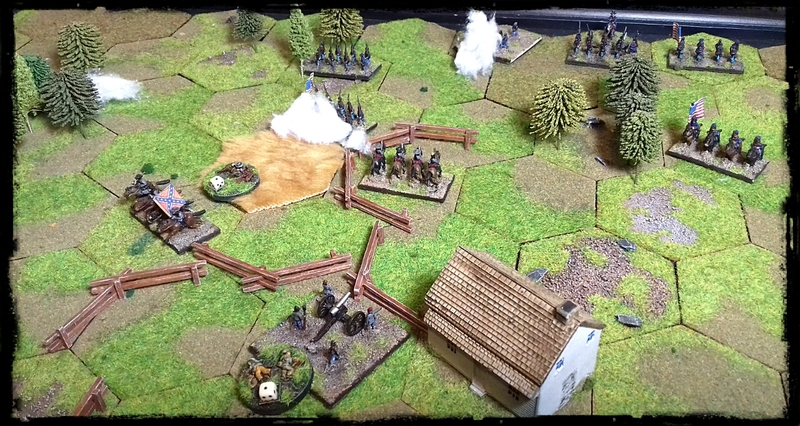 It was an interesting challenge to balance taking the offensive with the units you have on the battlefield and bringing on reserve units, which take time to get into the action. I have been settling in to my new gaming room rather nicely over the past couple of weeks and it’s given me the opportunity to spend some time playing more games, including a fair amount of solo play and games designing. I have been adapting the basic rules ideas from Richard Borg’s excellent Commands & Colors series (specifically Memoir ’44), combined with the dice mechanics from Space Crusade to create a Warhammer 40,000 version, allowing me to get more use out of my Epic 40k minis. The eastern agri-plantations, a million square hectares of rural plains dotted with farmsteads and small imperial settlements who managed the production of triffidicus plant oil, became a major muster point for the ork invaders. 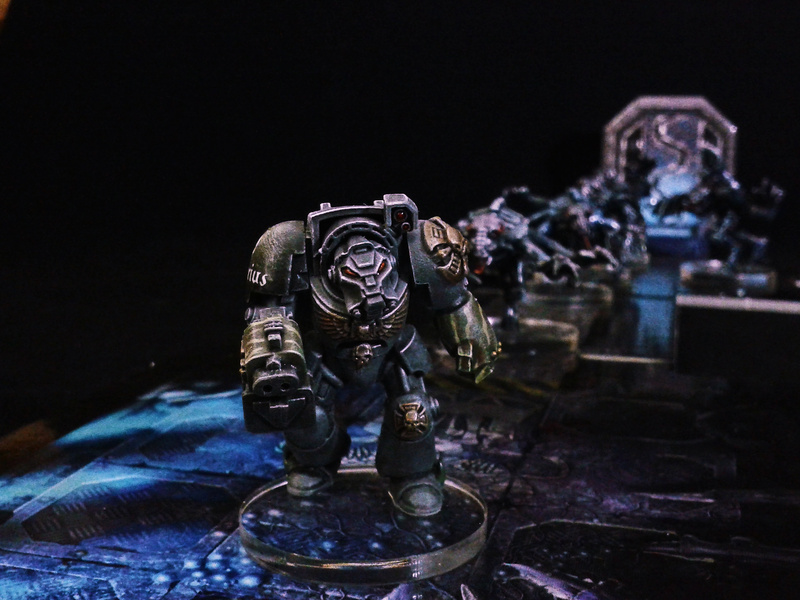 An armour detachment of Iron Eagles space marines conducted a lighting counter-attack at the vital crossing point of the Macharius bridge, hoping to bottle up the alien masses. 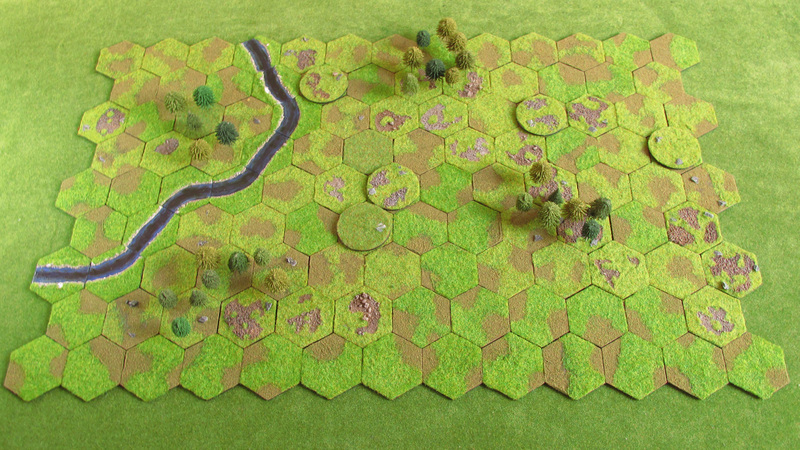 This scenario was generated randomly using the Fog of War and terrain-generation rules from the Epic 40,000 Battles book. The result was the Macharius bridge battlefield, pitching a full ork cult of speed army attempting cross the Grendoilor river whilst a slightly depleted space marine armour detachment with titan support, sought to hold the western bank. Birds-eye view of the battlefield and initial deployments. On the left and right flanks, there are Take & Hold objectives and on the bridge a Cleanse objective (these are the space marine objectives). The orks must reduce the space marines to 50% of their starting strength. 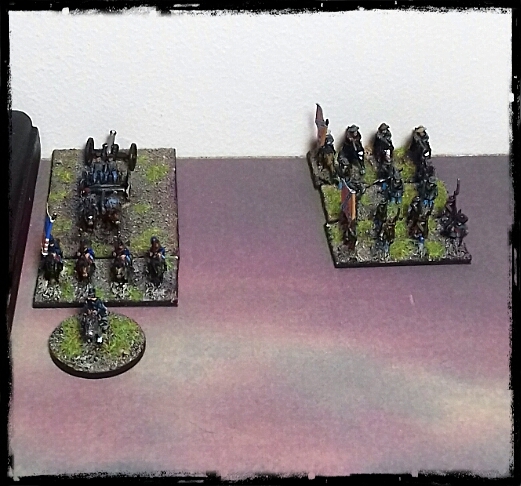 Using the Commands & Colours system, I set a command card limit for each army. 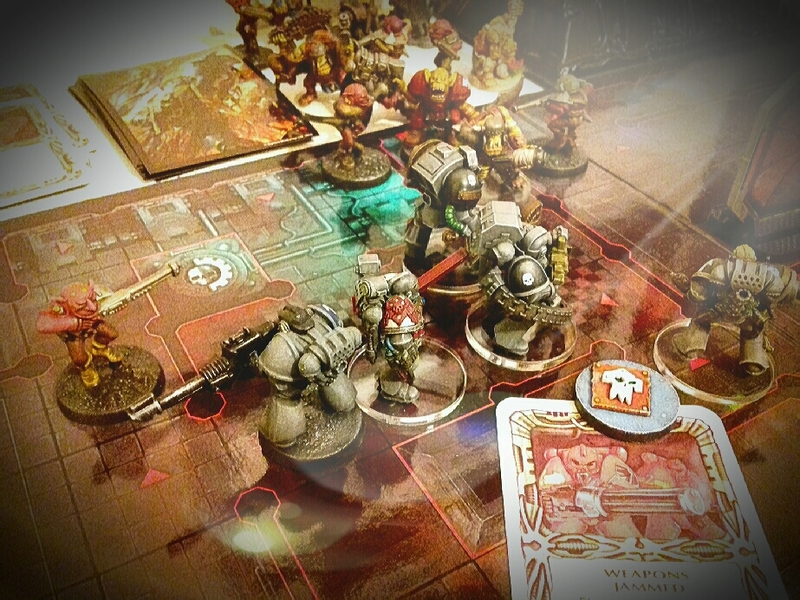 The orks had a hand of 5 cards and the space marines received a hand of 6 cards. 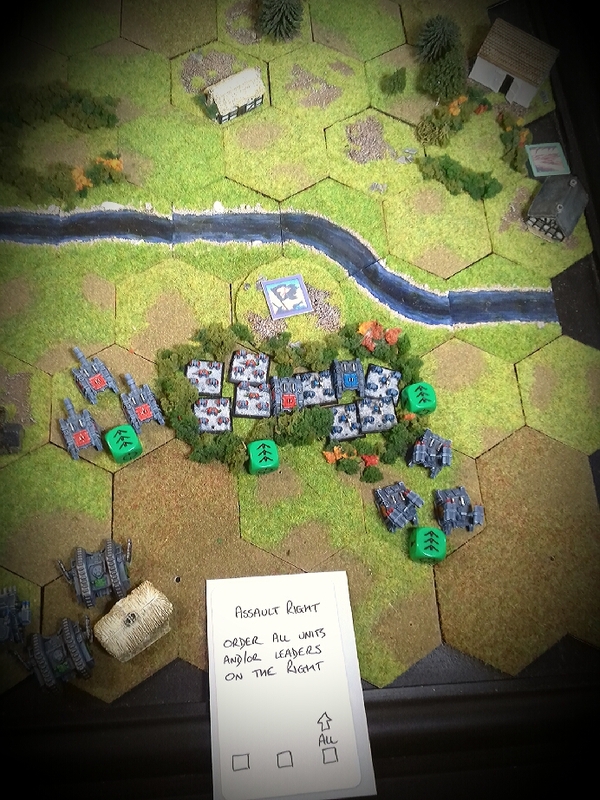 Each army took a turn to play a command card and then act upon the orders given. 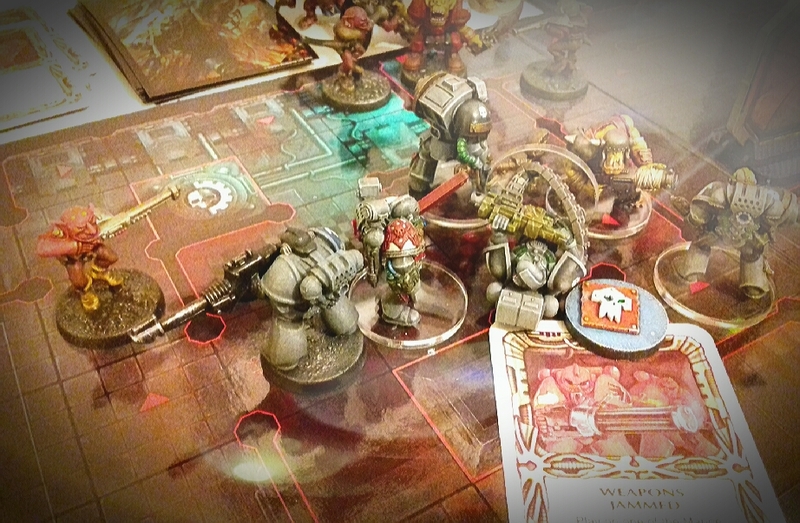 I took command of the space marines and used a solo playing aid, created by someone on board game geek website, for the ork orders. 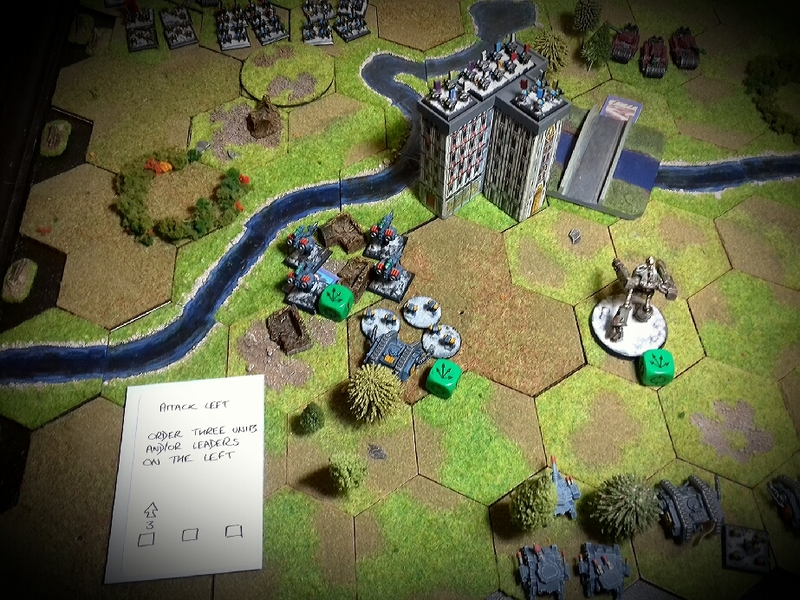 Three cards were chosen for the orks in ascending order of first, second and third best options and then a dice roll decided which command card was enacted. I took some photos during the battle to illustrate the basic movement and combat mechanics. 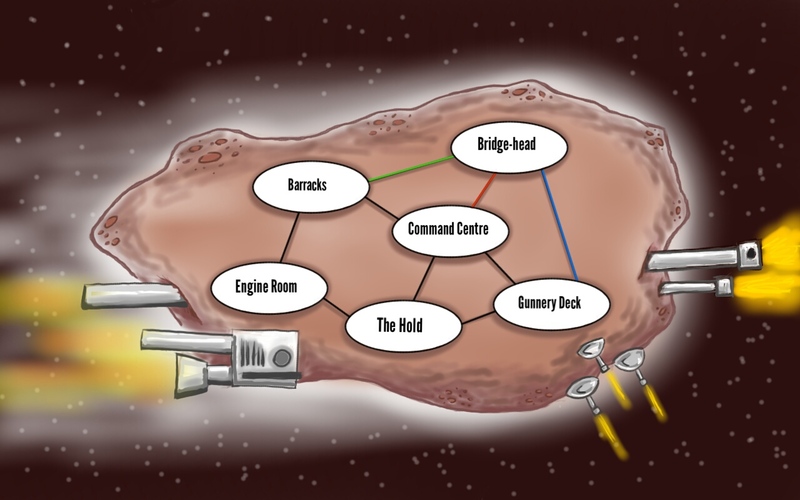 The first ork command card was a probe in the centre, allowing two units in the centre section to activate. They made a full move forward to secure the bridge. In response, the space marines gave an assault right order, allowing all the units on the right flank to deploy on one of their take and hold objectives. Later on, the space marines issued orders for three units on the right flank. They moved forward and prepared to open fire on the ork nobs holding the administratum building overlooking the Macharius bridge. 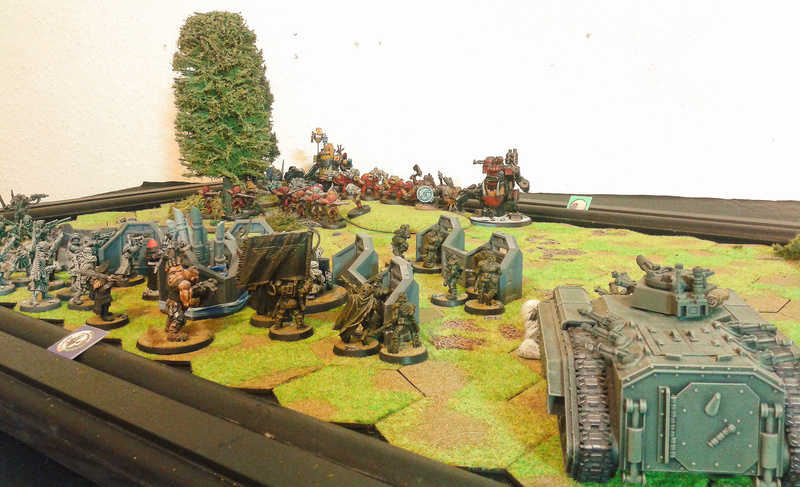 The battle progressed with major success for the space marines who deployed on their Take & Hold objectives on either flank, whilst warhound titan ‘Kessler’ sprinted across the bridge and cleared their Cleanse objective of green skins. For their part, the orks struggled to deploy their greater numbers to make an attack on the bridge. 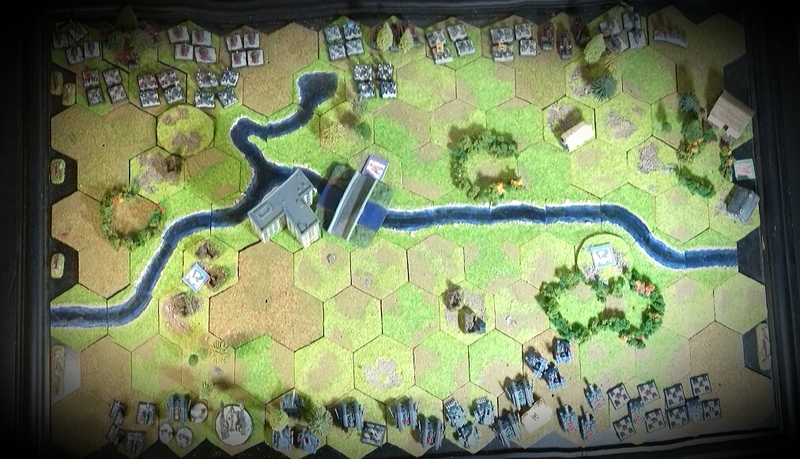 The tributary river and reservoir effectively split the ork deployment and created a choke point, which caused them issues with manoeuvring for the whole battle. 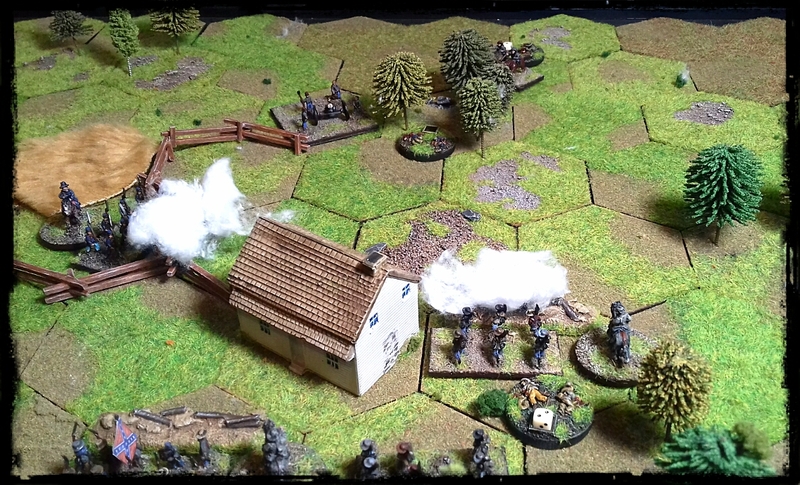 I am thinking of using the ‘cross-fire’ rules from The Great War version created by the Plastic Soldier Company, which allows units to combine their shooting dice. This will hopefully allow weaker units to ‘gang-up’ on stronger ones. 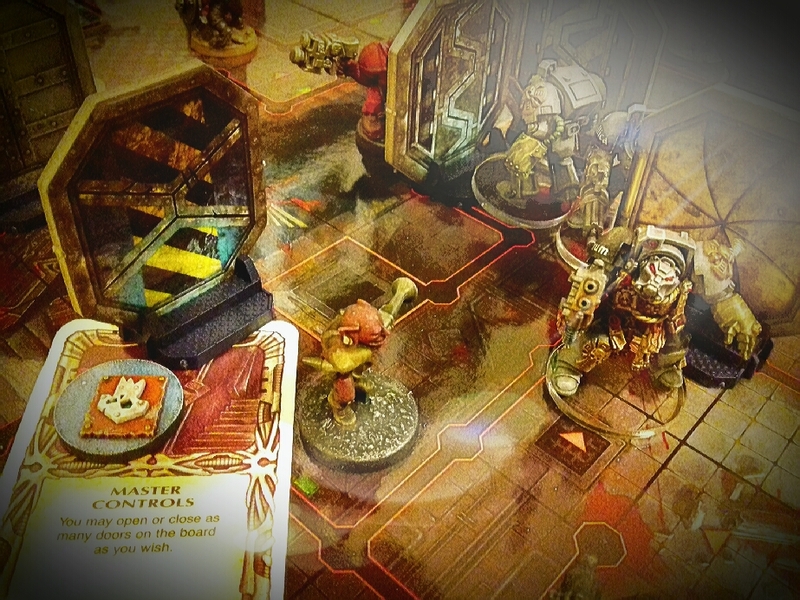 Having some time on my hands on friday evening, I decided to set up and play a solo variation of Space Crusade, using a few rules I had devised to supplement the core rules. 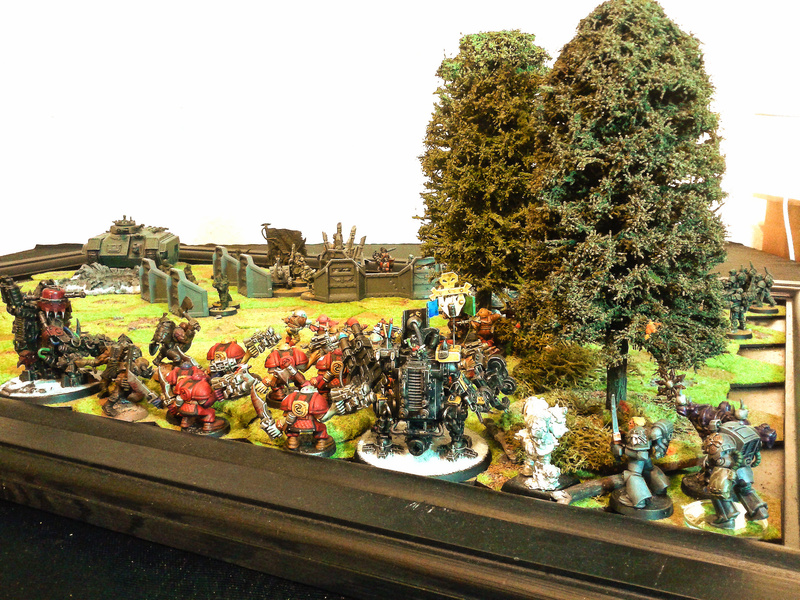 After securing a bridge-head (mission #1) upon the Ork hulk, the Iron Eagles sent a task force, lead by venerable Sgt. Vandorion. Their mission was to secure a foothold in the barracks sector and gauge the strength of the inevitable counter attack on the bridge-head from that quarter. 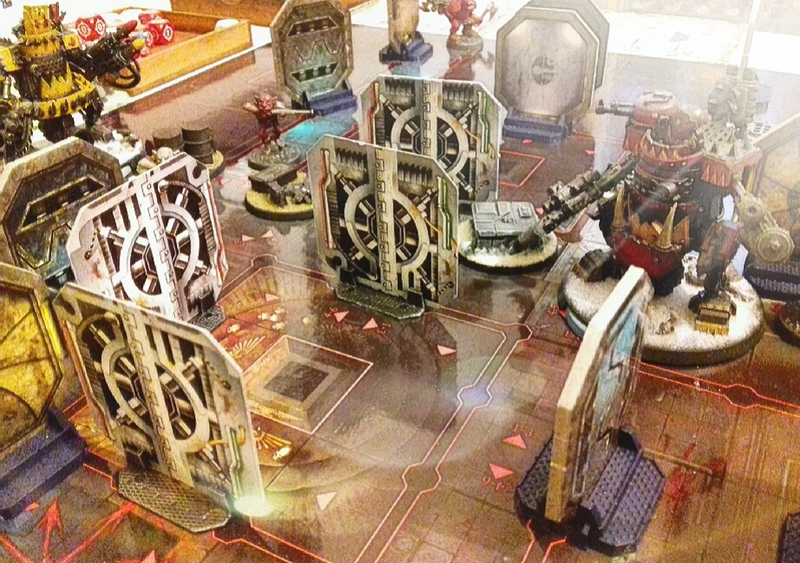 I used the board from the Execution Force boxed game and Space Hulk bulkhead doors. After the initial space marine deployment, every time a door is opened, D3+1 aliens are generated and deployed in the room or corridor. Aliens are generated by rolling two differently coloured D6 and consulting a chart. The bell-curve of results you can get from a 2×D6 roll allows for a realistic mix of aliens. For example, a roll that adds up to 7 (which has the most results possible) generates a gretchin, where as a result of 2 (which has the fewest) generates an ork warboss. This same 2×D6 roll is used for the alien reserve points at the end of each turn too. If at any point an alien generation roll comes up with a double, I took the top card from an ork command and equipment deck. Bionic Bits which allowed one particular ork warboss to re-roll a single dice in close combat. This produced an entertaining challenge and created some seriously tough orks who were well at home getting up close and personal! After an initially good start the fortunes of the Iron Eagles went downhill fast! Overwhelming numbers of green skins flooded in from all sides, roaring and slavering for battle. Brother Kiesel’s heavy bolter spits death until a round jams in the chamber! Clear it, clear it!?. Too late, a massive green skin brute strikes him a mortal blow..
As the task force is split-up, surrounded and cut down. Suddenly the bulkheads slam shut, cutting the survivors off from each other. Whilst me and my fiance are in limbo with the purchase of our new house, I have been living at her’s with my painting paraphernalia lying in storage. I have not been entirely idle though, as I have been assembling my recently purchased space marines for Space Crusade. 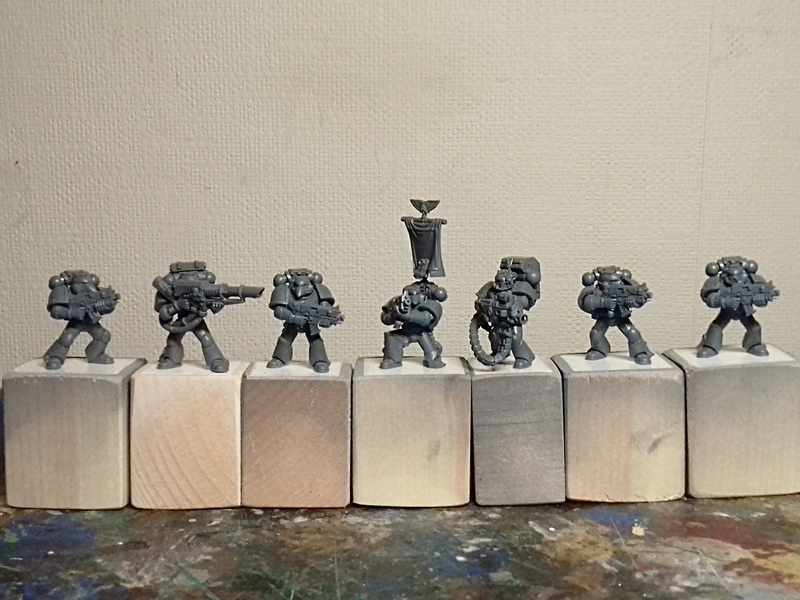 WIP – A small selection of marines, double-sided taped to blocks ready for spraying. I’ve also been putting a lot of thought in to a solo campaign which I would like to undertake, once I’m finally reunited with my wargaming stuff. 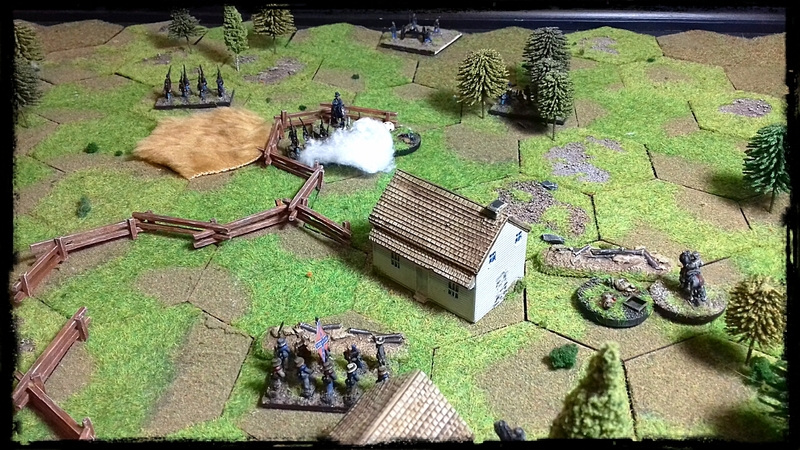 I have been keenly following Grid based wargaming blog, and have been thoroughly inspired to look at doing more solo gaming in the future. When the Empyrean spat forth a huge asteroid, which proceeded to change direction and make straight for the agri-world of Ardera IV, Imperial navy pickets stood up and took notice. Not generally known for their ability to change direction at a whim, this particular cosmic body was acting decidedly ‘fishy’. upon closer inspection, the enormous engines and ramshackle weaponry which adorned the surface of the asteroid could mean only one thing… Orks!! Was this just a lone vessel, dropped into real space by the random vagaries of the warp, or the vanguard of a large fleet bent on destruction? The question was largely moot, the obdurate belief of the Imperial creed was very particular in such cases, this was an aberration which deserved nothing more than being wiped from the face of the galaxy!! The local space defense fleet mobilised immediately and, led by Admiral Gruber van Schlessenspiel III, made to intercept the ork asteroid. Van Schlessenspiel was a washed-up void mariner who’s enormous pomposity was coupled with a distinct lack of talent for space conflict. Believing that this “ramshackle space turd” would give his fleet no trouble at all, van Schlessenspiel immediately engaged the ork vessel. His underestimation of the green skins proved to be his folly and in the following battle he lost half his fleet and his flagship, Vexatious Exemplar, was left powerless and adrift. The Iron Eagles battle barge the ‘Unendingly Overwrought’ arrived in the Ardera sub-sector to find an enormous ork asteroid hurtling through the void, leaving a broken Imperial navy fleet in its wake. Commander Fellix Stienner held his ops group on the bridge to outline his plan. The vanguard elements would be launched in boarding torpedoes to secure a beach-head in the less well-protected upper surface of the ork hulk. Once established, it would provide a ‘jumping-off point’ for further operations to cleanse the asteroid of the green skin filth. Objective – The boarding torpedo will strike in the area marked ‘Ingress point’. 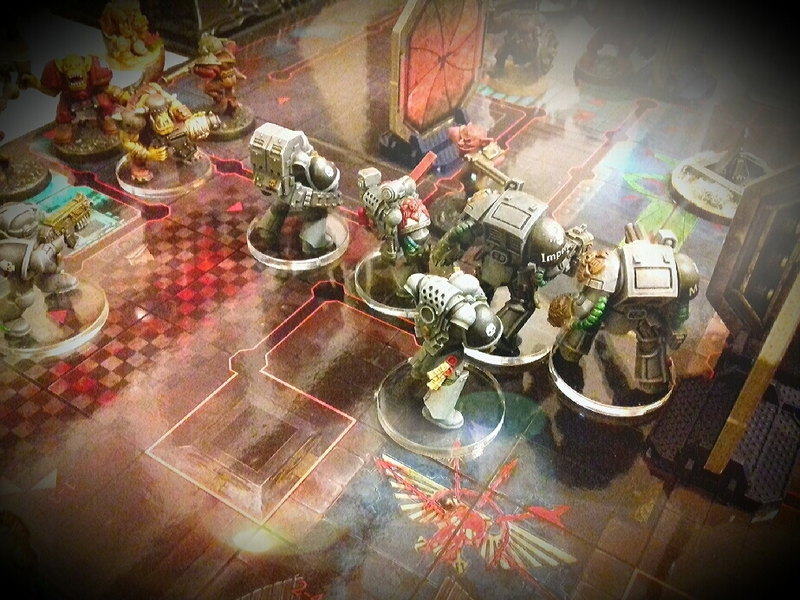 Once deployed, the space marine forces must engage and cleanse all xenos troops. Any quarters that are clear of enemy ‘filth’ will provide access to other areas of the hulk. Xenos reserves – a random number of reserves (D6) will arrive at any one of the routes from other areas of the hulk (D3) at the end of the aliens turn. 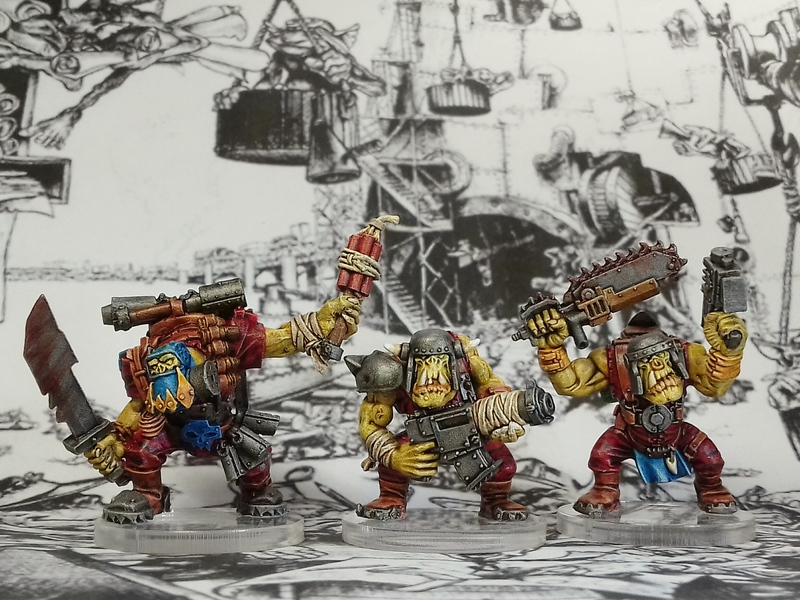 Ork and grot reserves only. I have yet to decide the strength of the space marines and also still have some work to do on the mechanics for solo play, including making my own event deck, rules of engagement for the green skin forces, etc..
Until then I shall keep my fingers crossed for a quick resolution to our housing situation and continue planning my miniature machinations. I have mentioned several times in the past of my fondness for the old board game Space Crusade. I have played many hours using both the core game and even making up my own scenarios, including rules for all sorts of other miniatures in my collection. I also have a copy of the White Dwarf supplement which introduces rules with different races to replace the space marine squads. 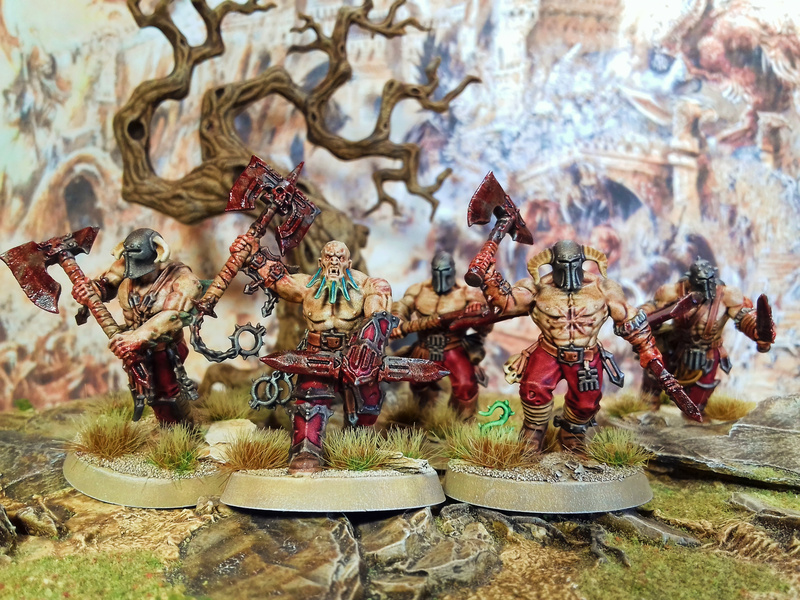 As I have always liked orks, I decided to collect a mob of Blood Axe Kommandos to send in to the hulk. The first batch of blood axe kommandos, including an original metal kommando on the left. Also, inspired by a recent post on Azazel’s Bitz Box, I painted up two old-school metal marines that I have had lying around for some time. Although apothecaries are usually bedecked in all white livery I decided that, in a galaxy that doesn’t recognise the Geneva Convention, it would be rather reckless to present oneself as such an easy target and so I gave him the basic Iron Eagles livery, with white and red shoulder pads. I really like this old veteran sergeant model and hope that, as he is holding an auspex device, he might help me to remember to use the ‘Scanner’ equipment card which allows you to look at face-down blips. It’s a really useful card if you’re on an assassination mission and need to find a particular alien to kill, or if you just want to find out what’s in the next room without blundering in there, unfortunately I constantly forget to use it!! My hobby activities will be slowing down next month as I am moving in with my fiance next week until our new house is ready and my hobby stuff will be put in storage, I have put together a small ‘portable nerding kit’, so I can keep on with some model assembly but the paint shop has been shut-down for the time being. 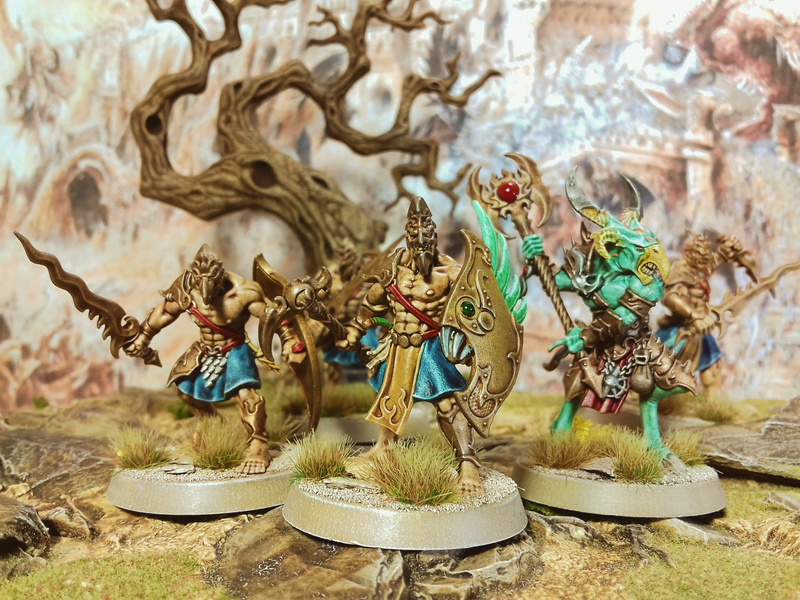 As I mentioned in my earlier post, I procured a copy of Warhammer Quest: Shadows Over Hammerhal and I have been merrily beavering away over the summer, glueing them together. 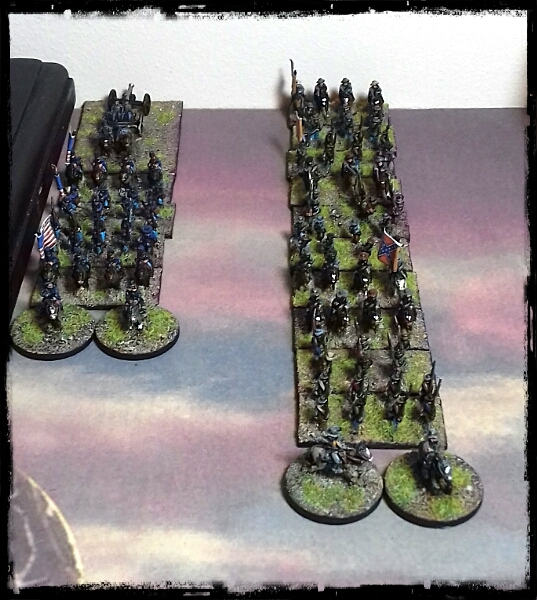 I’ve also been painting them up in small batches and here is the first wave. 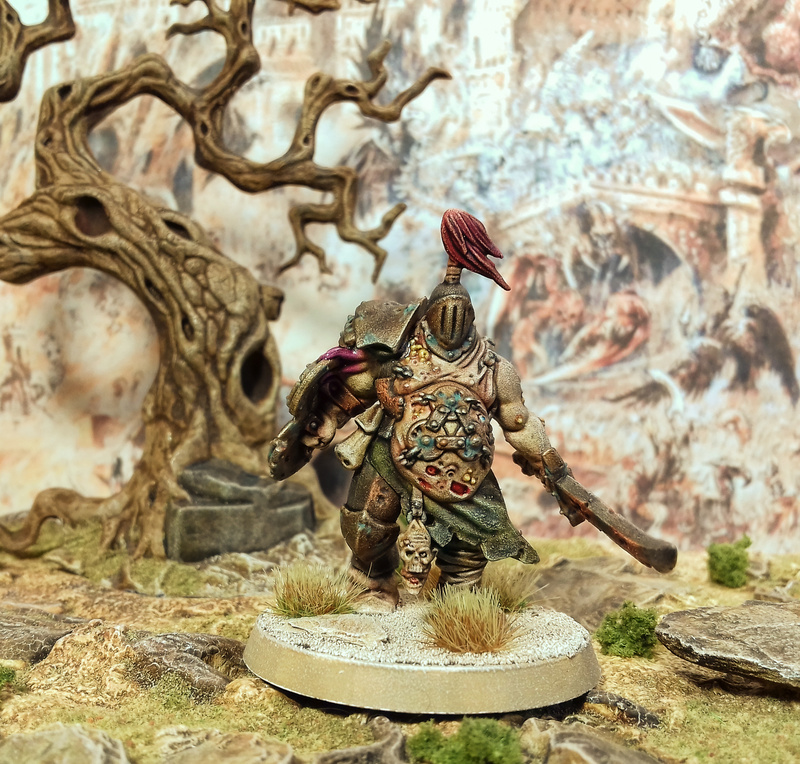 Viscount Bubo Spittlesucker III, lord of the blight. He of the sticky armpits. Trontek the inscrutable and his acolytes are blessed with the presence of a child of Tzeentch, a chittering Tzaangor. 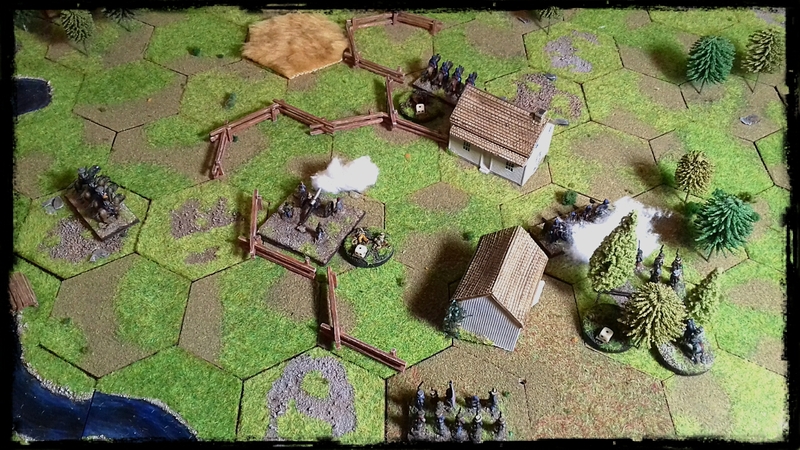 Over the past few months I have found myself wandering away from table-top wargames, toward miniature board-games. 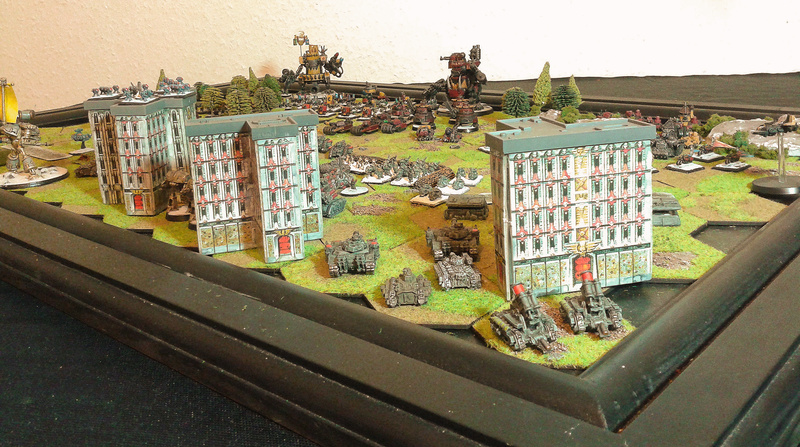 This has been due mainly to the ease by which games like Space Crusade can be set-up and played, within a single gaming session, rather than the two or three sessions it takes to play out Epic battles. Out in the deep black no-one can hear you scream!.. 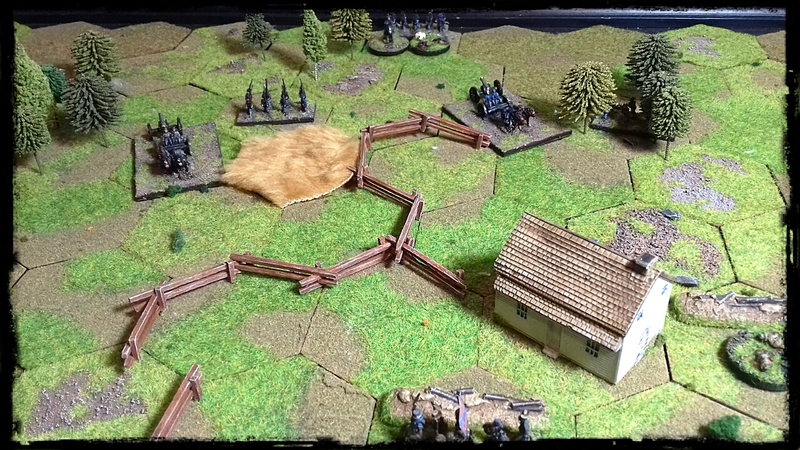 This fast-paced and tense game of blazing storm-bolters and scything talons, is always an absolute blast to play! Several years ago a friend of mine had the idea of buying a copy of the game components on eBay, along with a couple of boxes of genestealers and ask if I’d want collect a set of terminators to go with it. The project was eventually left with me and I have played many of the scenarios from the book over the years. 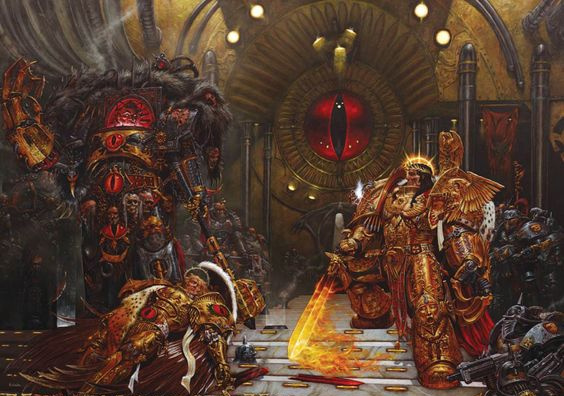 Going under-ground… In the Arcologies of Calth, Roboute Guilliman’s indomitable Ultramarines fight bitter subterranean battles with Lorgar Aurelian’s arch-betrayers, the Word Bearers. Another project idea, this time from the ubiquitous Graham. The components for this game can be found at a very reasonable price on eBay and using our collected Space Crusade minis, we have played all but the last scenario from the rule book. Whatever you do, don’t split the party!.. 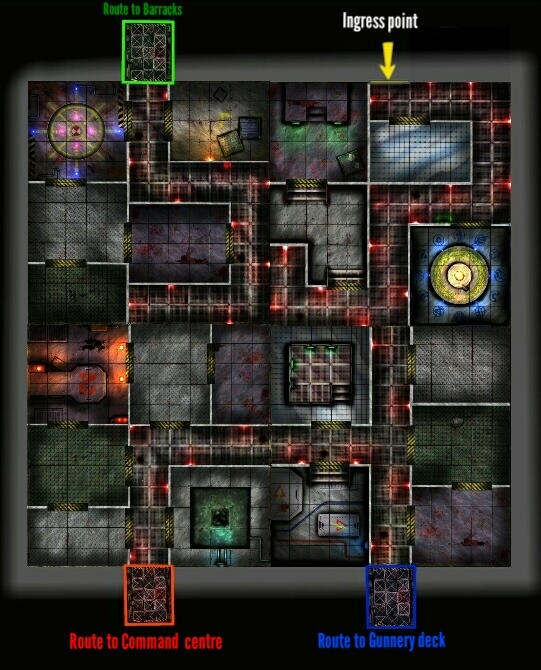 Dungeon dwellers unite in this revamp of an old classic. 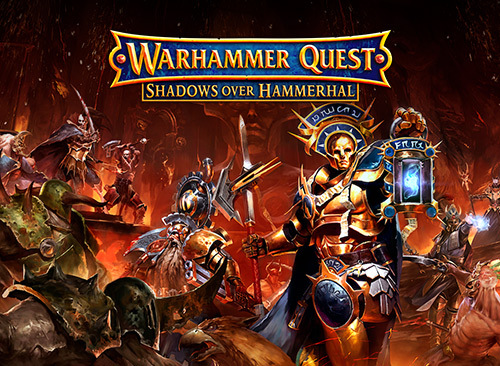 Last but by no means least, my newest acquisition is Warhammer Quest: Shadows over Hammerhal. I looked at both this and Silver Tower, but decided that I rather liked the possibilities presented by a GM lead game, rather than cooperative play. Being that I lack any competitive edge and enjoy creating fun and interesting games, playing the GM would suit me rather well, along with the fact that I much prefer to play the nefarious bad guys than the doughty heroes of course! The ever dastardly Graham and I play many different games set in the world of Warhammer 40k, and for someone as tactically challenged as myself, simply keeping a tally of wins and losses holds little interest. Instead, we combine the multitude of different games into a flowing narrative campaign. This stops things from getting stale and lets me concentrate on being creative, rather than cursing my ill luck and general lack of tactical nous. 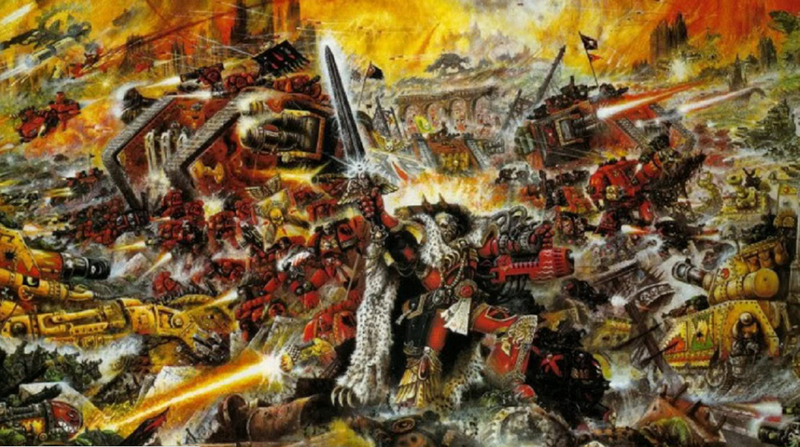 There was a time long ago, when space marines were space marines and demons were just a figment of the imagination, so don’t worry your pretty little head about it. 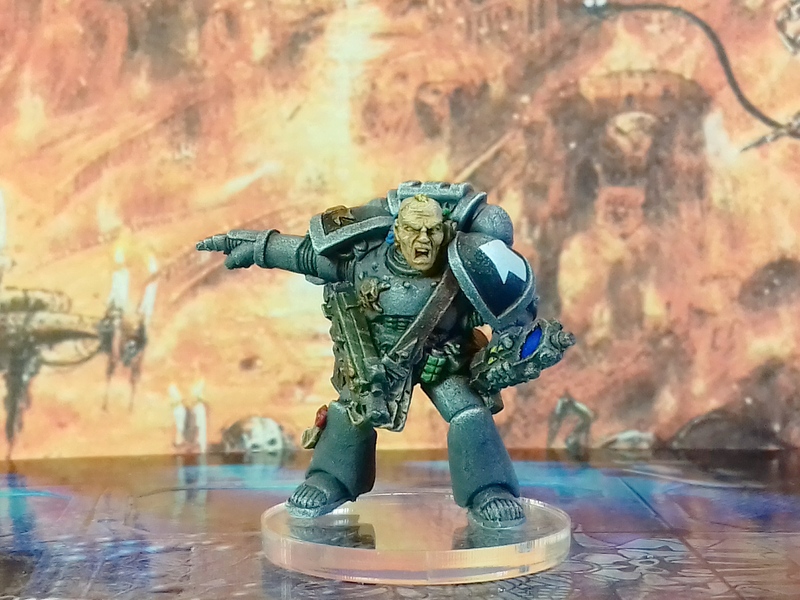 Known as the Golden Age of the Imperium, it was a time when the mighty Emperor of mankind was less ‘throne-bound’, and got out and about the galaxy a little more, leading His demigod sons the Primarchs, in their quest of inter-galactic genocide. However, it all started to come undone the day the Emperor realised that He had left the oven on, and had to rush back to Terra to attend to it, leaving His favourite son Horus in charge until He got back. Horus was brought low by an envenomed blade and started to hear voices from the Warp. The daemonic susurrations told him that the Emperor didn’t even posses an oven! And was actually going back home to the adoring fans, gaining all the glory while His sons did all the hard work. Horus did what any right-minded son would in such a situation. He plunged the whole Imperium into civil war, sending it into a catastrophic downward spiral from which it would never truly recover. 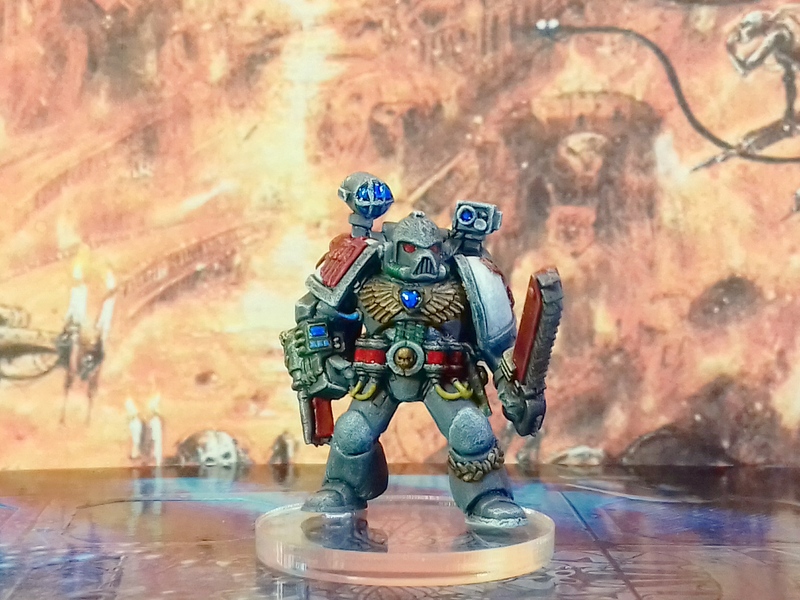 In the wake of what become known a the Horus Heresy, the space marine legions were disbanded and sub-divided into smaller chapters, so that no-one would be able to wield such power ever again. One such space marine chapter was the Iron Eagles, formerly of the Raven Guard legion, which is the subject of our story. In the aftermath of the Horus Heresy, mankind was still plagued by the myriad hostile aliens (no rest for the wicked and all that!) On the agri-world of Ardera IV, an Ork Waarghhh! was gaining impetus and simply had to be stopped before the green tide scoured the planet clean of all humankind. Ardera IV was a planet within a sector of Imperial space simply chock full of agri-worlds, exporting a plethora of produce to feed the Imperium. Ardera’s main export being that of oils and chemicals derived from triffidicus plants. These six-foot tall carnivorous plants, were not only able to walk, but could fire a stinger out around seven to eight feet, allowing them to incapacitate their prey. On the plus side however, they contained an oil which could be refined to create many useful fuels and chemicals. It was said that a quarter of a billion lho sticks were lit every minute thanks to triffidican oil. Triffidicus plants were by no means the only indigenous species upon Ardera IV which was inimicable to life. When man first set foot upon her, the planet was simply teeming with strangler-vines, exploding spore frogs, spine-shooting cacti and much more besides. After a century of cultivation however, the flora and fauna become manageable enough to sustain a colony of thousands of triffidicus ranches. With the ork incursion, came much upheaval. Vast swathes of land fell into the greenskin hands which were left un-managed, allowing the triffidicus plants to break free from their ranches, to seek food (of which in the aftermath of the fighting, there was plenty to spare!) In their wake the death forests started to reclaim the planet. The orks had to be stopped and to this end a vast imperial crusade was sent to Ardera, including a battle group of the Iron Eagle space marines. Aeronautica: A fierce air battle ensues across the skies of Ardera IV, as the Imperials struggle to gain air superiority over the Orks. Mighty Titans can be seen far below on the surface. 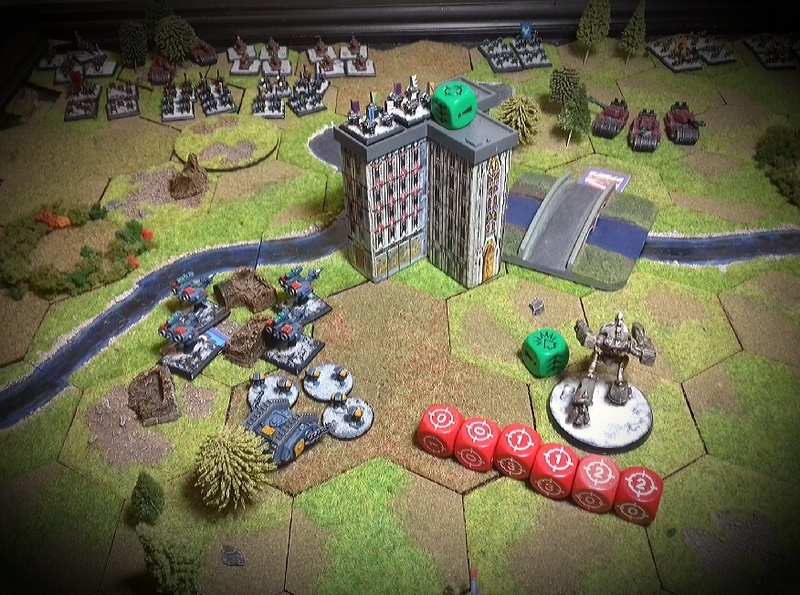 Epic: The defenders of hive Menddrica ready themselves to repel yet another ork attack. 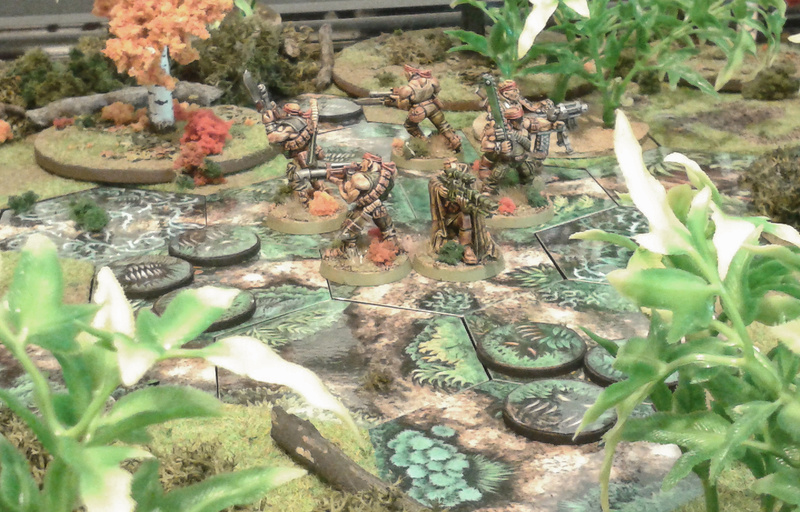 The greenskins swarm toward the hive. Fortunately the Imperial defenders have ‘angels upon their shoulders‘. The Imperial navy’s persecution of the air war has been exemplary, allowing units to be spared to support the ground conflict. ‘Big guns never tire!’ Though they will be surely tested this day! Both Gork and Mork are in attendance today (or at least there ork built proxies Boom Boom Mancini and O’wd Yella). 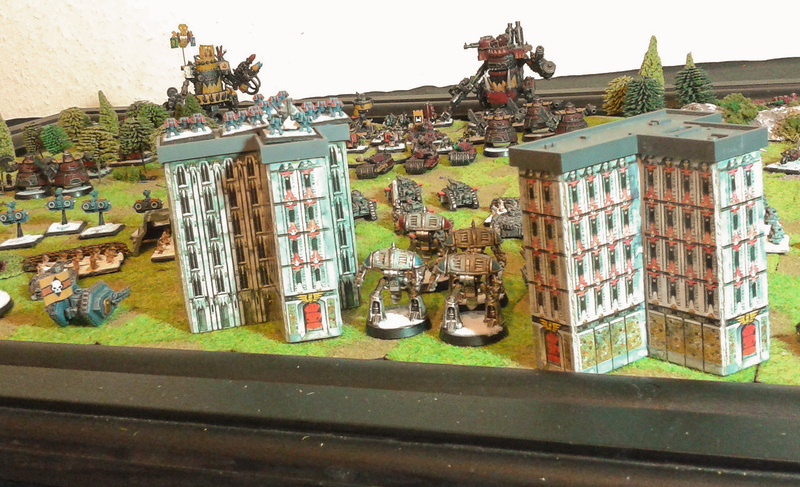 Reaver titans of the legio Hydra Cordatiss square up against the xenos abominations. Space Crusade: At the tactical level, the troops of the Imperial Guard strive to protect the hives all important anti-aircraft guns. Behind the lines there seems to be treachery afoot. A cabal of space marines confer with the Ork warlord, as an emissary of the foul Word Bearers legion performs some arcane ‘mumbo jumbo’. Lost Patrol: A reconnaissance platoon of the 7095th Devlan Mudders struggles through the death forests, somewhere deep behind enemy lines. They are urgent to get back to friendly lines with the critical intelligence that they have gained on the enemy. The forest is full of hidden dangers! Will they get back to deliver their news of the Iron Eagles treachery? 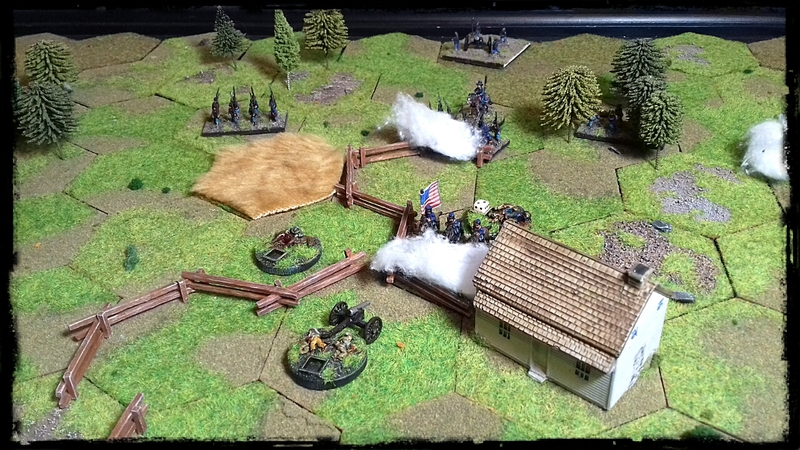 As well as all the other projects I’ve been detailing on this very blog over the past couple of weeks, I have been up to my neck in static grass and flock whilst making a terrain board on which to play Battle Cry using my 10mm American Civil War miniatures. Battle Cry is a hex-based miniatures board game from the Command & Colours family of games created by Richard Borg and as I’m not as much of an aficionado of the American Civil War as bloggers such as Arkiegamer, its simple mechanics and plethora of historic scenarios makes it perfect for the neophyte such as I to learn more about this conflict. This is just one combination that can be created and I have enough hexes to increase the river or remove it entirely. Many of the plain hexes are drilled to allow for trees to be screwed in creating forested areas and the round pieces can be laid on top to represent hills. I still have some extra terrain pieces yet to make including split-rail fences, entrenchments, hay fields and the like, but for now I’m ready to start playing the first scenarios from the rule book. Let’s start raising that rebel yell! Anything for the weekend Sir? In the grim darkness of the far future, there is only war. Art, Miniatures, Sculpting, and more! Musings of a Paint-Slinger for Hire. 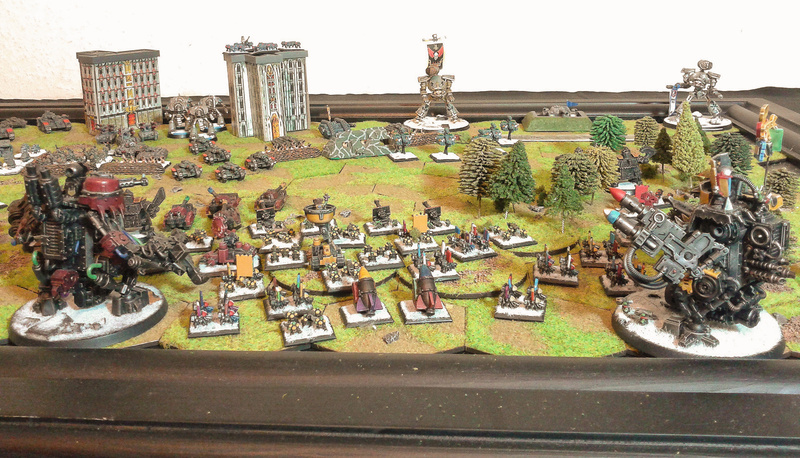 Wargaming in the Age of Austerity! Out of the Basement and into the Streets. 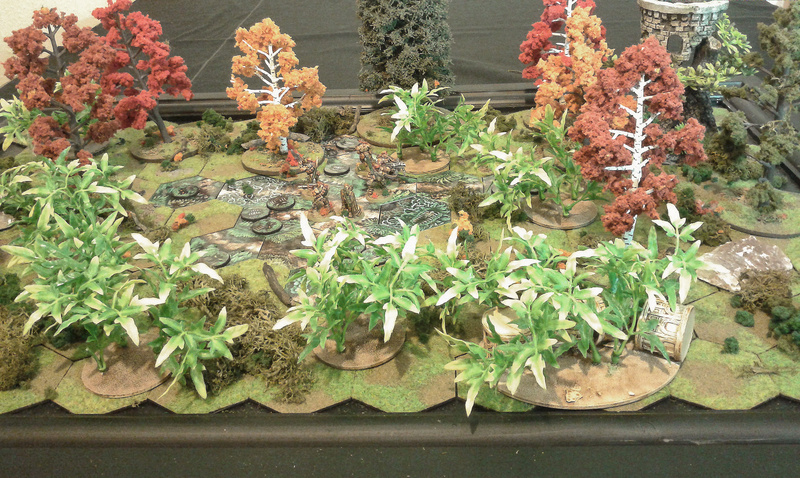 A TV Channel dedicated to Miniature Wargaming. Dave's wargaming and archaeology related ramblings.